New documentary evidence provided to PNGi puts an explosive spotlight on the alleged trade in counterfeit cigarettes. Insiders claim these documents confirm recent allegations that locally registered companies are illegally importing, and then re-selling counterfeit cigarettes, while law enforcement agencies intentionally turn a blind eye. Earlier this month, PNGi highlighted claims a Chinese owned business, Goldensborough Limited, has been smuggling, manufacturing and repackaging counterfeit cigarettes and committing tax fraud. That report focused on the contradictory positions taken by different law enforcement agencies and the evidence pointing to a high level cover-up. Police and immigration authorities initially claimed Goldensborough was a rogue operation, involved in various illegal activities connected to organised foreign crime gangs. This was after they conducted well publicised raids on its business premises on the Kennedy Estate in Port Moresby. The PNG Customs service meanwhile publicly defended the company, saying its operations were licensed and legal. This was despite its own records allegedly showing Goldensborough’s declared cigarette imports were far lower than the numbers required to sustain its nationwide sales. The waters were further muddied when the Immigration Minister, Petrus Thomas, quickly intervened to cancel the visas and issue deportation notices against seventeen Goldensborough directors and employees, thus shutting down any potential criminal investigation. This led to allegations of a political cover-up; allegations that were reinforced when it was reported police charges against the company had mysteriously been dropped. While the whole affair seems to have been swept under the carpet, PNGi has obtained new evidence that sources claim further implicates both Goldensborough and a second company, Yonnie Limited, in the illegal importation of cigarettes, customs fraud and tax evasion. In January, Goldensborough and Yonnie imported three shipping containers into Port Moresby. According to Customs documents, the containers hold thousands of disposable plastic drinking cups and prefabricated doors, windows and frames. However, Customs inspections have instead revealed hundreds of cartons of cigarettes. The Customs Declaration filed by Yonnie Limited is dated 31 January 2019. It is for a 20 foot shipping container that arrived in Port Moresby from Cambodia on the general cargo vessel Helmuth Rambow. The declaration lists the ‘Importer’ and the ‘Person Responsible for Finance’ as ‘Yonnie Limited T/A [Trading As] Total Freight Solutions’. However, cross referencing with the records of the Registrar of Companies, reveals Total Freight Solutions, although owned by Yonnie Limited, was deregistered as a business name on 3 December 2018. The de-registration form was signed by Yonnie’s sole director and shareholder, Jeremiah Jerrifia. The much bigger issue though, is the contents of the container. According to the Customs Declaration it should hold 465 cartoons of disposable plastic drinking cups. However, it is alleged a physical inspection of the container has revealed 477 cartons each containing 10,000 counterfeit cigarettes. Of the total, 355 cartons contain the ‘Cambridge’ brand and 122 cartons ‘Pall Mall Red’ cigarettes. These could be worth over K3 million on the streets. The tax implications of this alleged illegal importation are huge. The 465 cartons of plastic cups the container was meant to hold had a declared value of K50,000. The GST payable was just K4,957.52. In contrast, the excise, duty and GST payable on 477 cartons of cigarettes would be over K3.2 million! 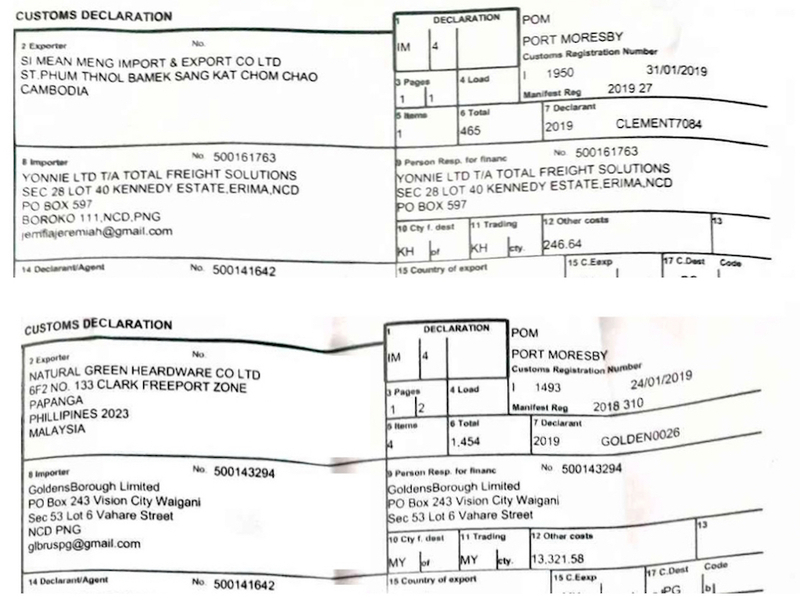 The second Customs Declaration obtained by PNGi was allegedly filed by Goldensborough Limited and is dated 24 January 2019. The date is significant because it is six days before Customs boss Ray Paul held a media briefing to defend the company’s operations. The Declaration relates to two shipping containers said to hold 700 packages containing ‘doors, windows and their frames’. The containers arrived from Malaysia on the ship Carpenters Sirius. Goldensborough’s containers supposedly contain doors, windows and frames. According to its most recent Annual Return, Goldensborough’s principle activity is the ‘import, wholesale and retail sale of cigarette products’ – not doors, windows or any general hardware or building materials. Investment Promotion Authority records also indicate that the company is only certified to engage in the wholesale/retail of food, beverages and tobacco, and the manufacture of tobacco products. If the content of the shipping container was doors and windows, Goldensborough would be acting outside their remit, in violation of the Investment Promotion Act 1992. However, it is alleged a physical inspection of the containers has revealed a completely different cargo – 1,042 cartons each containing, in this case, 10,000 Golden Bridge cigarettes with a street value of over K8 million. The total tax avoided through the two alleged false customs declarations filed by Yonnie and Goldensborough is well over K10 million. This massive alleged tax fraud could help to explain how Goldensborough has been able to sell their cigarettes so cheaply across PNG. A single cigarette normally costs around K1. This is because while a single stick may only cost 20 toea to produce, the excise and duty that is payable is around 68t. Goldensborough, it is alleged, sell their products for just 35t, which would be financial ruinous if they are not somehow avoiding tax. Falsely declaring their imports as doors and windows is one way to do that. We should also note the address for Yonnie Limited, given on both the customs form and its IPA record, is the Kennedy Estate in Erima. That is the same Kennedy Estate where Goldensborough is alleged to operate its illegal cigarette repackaging factory. While we understand that Customs officers are taking action over the Yonnie importation and lawyers for British American Tobacco are filing court proceeding for intellectual property infringements, Customs are yet to issue any infringement notices against Goldensborough Limited or impound its two containers. It will be recalled that after the police and immigration raids against Goldensborough last month, its was Customs Commissioner Ray Paul who called a press conference to publicly defend the company, describing it as a legitimate business that pays its taxes. Mr Paul should now make clear whether he is still defending the company, confirm whether the allegations above are true and, if so, explain why his officers have so far not taken any action over the new importation. The Police Commissioner, Gary Baki, should also explain why the original criminal charges against Goldensborough and its directors and owners were reportedly dropped and what action will now be taken to investigate the new allegations.